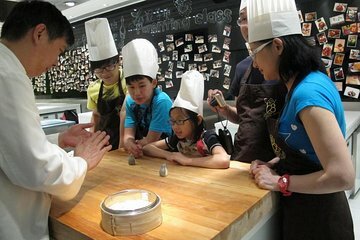 Learn to make traditional Chinese snacks during this Dim Sum Cooking Class in Hong Kong. Experience the pleasure of handcrafting bite-sized dumplings, sweet desserts and savory spring rolls under the direction of your expert chef and teacher. Gain a deeper understanding of the flavors and techniques that make this cuisine flavorful and unique, and put your imagination to work while fashioning marine animals from some of the ingredients! Once the class is complete, enjoy your dim sum—along with other dishes created by your chefs! Receive a recipe to take home with you! Your friendly local guide will meet you at the Tsim Sha Tsui cooking studio where you’ll spend an afternoon experiencing the flavors, smells and textures of China during this Dim Sum cooking class in Hong Kong. Your one-hour lesson includes a demonstration by an expert chef, who will explain techniques used to create shrimp dumplings, spring rolls and desserts that look like animals! Try your hand at each new creation at your own private chef’s table, where you’ll find detailed recipes and instructions to create each dish. Your friendly chefs will continue to cook and create while you’re at work to insure your dim sum meal is supplemented with other traditional dishes. At the end of your class you can enjoy a Chinese afternoon tea with new found friends!